The Legend of "Bloody Mary"
Historically, the "Bloody Mary" ritual encouraged young women to walk up a flight of stairs... backwards... in a darkened house... while holding a candle and a hand mirror. (Because everything about that is safe.) As they gazed into the mirror, they were to say the name "Bloody Mary" three times... which would let them see their future husband's face. There was, however, a chance that they would see a skull (or the Grim Reaper), which indicated they were going to die before they married. 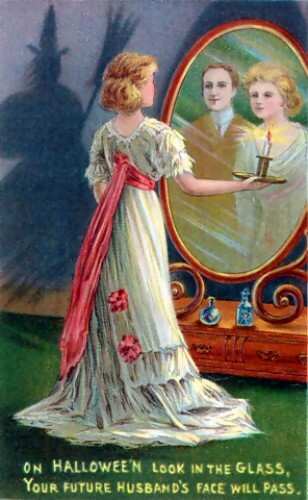 In the present day, the summoning ritual requires that the lead participant must not look directly for Bloody Mary, but at their own image in the mirror.